This paper was written for the 2015 University of South Carolina Rhetorical Theory Conference, which meets in October. The conference theme is “Rhetorical Theory’s Others,” and I am part of a working group tasked with theorizing “distraction” as an “other” of rhetoric. Our group read Matthew Crawford’s book The World Beyond Your Head and used it to theorize the relationship between rhetoric and distraction. Given this, what does the rhetorician have to say about distraction, a topic that has encouraged a cottage industry of books and thinkpieces? This was one question our working group brought to Matthew Crawford’s The World Beyond Your Head, and it was an apt one given that Crawford himself argues for an interdisciplinary and synthetic effort when tackling what he calls the “cultural problem” of attention. [note]The World Beyond Your Head, 5–7. [/note] Crawford’s book attempts “an ethics of attention for our time,” an ethics that is primarily concerned with ethos, with our contemporary environment. He positions the book as “a capacious reflection on the sort of ethos we want to inhabit.”[note]Ibid., 7. [/note] Crawford’s ideal ethos is concerned with “the right to not be addressed,” and one of his more provocative proposals is for an “attentional commons.”[note]Ibid., 13. [/note] He argues that we have ceased to see our own attention as something to be defended, and his primary concern is the “mechanized” demands made on our attention from afar: “The ever more complete penetration of public spaces by attention-getting technologies exploits the orienting response [of humans] in a way that preempts sociability, directing us away from one another and toward a manufactured reality, the content of which is determined from afar by private parties that have a material interest in doing so.”[note]Ibid., 10. [/note] He goes on: “The valuable thing that we take for granted is the condition of not being addressed. Just as clean air makes respiration possible, silence, in this broader sense, is what makes it possible to think.”[note]Ibid., 11, emphasis in original. [/note] Crawford’s attentional commons would preserve and protect the right to not be addressed so that we might have time and space to think. When Crawford describes the noise that crowds us on a daily basis (advertisements at the airport, the buzzing of electronic devices, the crush of email), I identify. But this identification points directly at the larger cultural problem that rhetorical theory can and should help address. This narrative of distraction is an extremely privileged one. The first person plural of Crawford’s book (and of similar texts by Sherry Turkle, Nicholas Carr, and others) does not always acknowledge that “our” narrative of distraction is not a universal one. [note]Turkle, Alone Together; Carr, Nicholas, The Shallows. [/note] By this, I do not mean that “we” are not distracted. Indeed, everyone is distracted—some more than others. But the call for a less distracting ethos does not always recognize the imbalances in the system, the unequal distribution of distraction. Distraction names the demands that we do not want to face. These are demands we have not chosen, and they arrive whether or not we have invited them. What do such demands announce? For one, it announces an answerability that was always there. This is the affectability or exposedness theorized by Diane Davis in Inessential Solidarity: “an affectability or persuadability that precedes and exceeds symbolic action.”[note]Davis, Inessential Solidarity, 19. [/note] Distractability is another word for persuadability—an unavoidable openness to the other. [note]Crawford likens distractability to obesity, since it feeds on “hyperpalatable” stimulation. The World Beyond Your Head, 16. [/note] However, something else is at work here as well. Distraction announces, even if only for a moment, that you are mismatched with the environment, that something about this space at this particular moment is out of whack for you. To distract is to pull apart, to pry you away from what you were trying to do. It is an uncoupling of you and your environment. You are trying to pay attention, and a distraction arrives. If distraction pulls apart, then attention seeks out connection—the Latin attendere means to turn or stretch towards something. If I am paying attention to something, I turn toward it and connect with it. Distraction disrupts the circuit. If our contemporary environment has encouraged ruminations on the dangers of distraction, it is an indication that those of us accustomed to seamless interactions (interactions with a world seemingly form-fitted to our body) are being pulled asunder. Minutes after considering these various strategies, Kweku was pulled over by police. When the flashing lights appeared, he did not carry out his plan: “Instead, I rifled through my last few minutes on the road, trying to work out what I’d done to draw the officer’s attention. I quickly ruled out everything I could think of.”[note]Ibid.,[/note] The police officer said he’d made an unsafe lane change but later admitted that it might have been another driver. Kweku was free to go. This episode could not be more different than Crawford’s discussions of distraction, and this is primarily because the world is much better suited for Crawford’s body than it is for Kweku’s. Think of the attention it requires to live in a world so ill-fitted for your body. Think of how distracting it must be. Think of Kweku’s right to not be addressed. Crawford might respond that this is a different kind of demand on our attention, that he is concerned with mechanized and manufactured attempts to capture our attention from “afar.” His preferred ethos would insist that the distractions of virtual reality (representations) that pull us away from one another be set aside in favor of engagements with reality. That reality involves both face-to-face interactions and engagements in skilled craftsmanship. Crawford links our contemporary problem of distraction to the Enlightenment impulse (his primary villain is Kant) to see the world as a set of representations: “The creeping substitution of virtual reality for reality is a prominent feature of contemporary life, but it also has deep antecedents in Western thought. It is a cultural project that is unfolding along lines that Immanuel Kant sketched for us: trying to establish the autonomy of the will by filtering material reality through abstractions.”[note]Crawford, The World Beyond Your Head, 73. [/note] Kant’s disregard of the noumenon in the name of the phenomenon lands us in the realm of information overload. We are inundated with representations, leading us away from reality. Crawford’s solution to this problem is a focus on an engagement with reality by way of skilled practices that help structure our attention (practices such as glass blowing and organ making). By engaging with the real (and here he primarily means wood, glass, and metal) we can re-center our attention and attempt to stave off distraction. For Crawford, such skilled practices are not about achieving autonomy—quite the opposite. They are about “submitting” to material constraints and about seeing oneself as part of a longer history and tradition of craft, traditions that offer methods of tuning out immaterial, virtual noise and focusing in on material reality: “External objects provide an attachment point for the mind; they pull us out of ourselves. It is in the encounter between the self and the brute alien otherness of the real that beautiful things become possible.”[note]Ibid., 27. [/note] This choice to submit to material reality is an attempt to attach to objects and to fend off being pulled asunder by the unwanted address. In an encounter with “brute alien otherness,” Kweku draws upon the lessons learned from “The Talk,” but the result was not so much beauty as survival. The differences between organ-making and “The Talk” are obvious. However, maybe the similarities are more compelling. They both structure attention through rituals that “relieve us of the burden of choice and reflection, as when we recite liturgy.”[note]Crawford, The World Beyond Your Head, 23. [/note] They both rely on a tradition passed down from experts to apprentices. They both involve a very direct engagement with material reality. A queer phenomenology would offer rhetoricians a way to turn their attention to distraction. It would, by definition, be distracted. Queer phenomenology is “a disorientation device; it would not overcome the disalignment of the horizontal and vertical axis, [instead] allowing the oblique to open another angle on the world.”[note]Ahmed, “Orientations,” 566. [/note] This is a method for seeing the red herring not as a distraction but as a reminder that the smoothness and continuity of a space is fictional—that my right to not be addressed is not a right but a privilege. 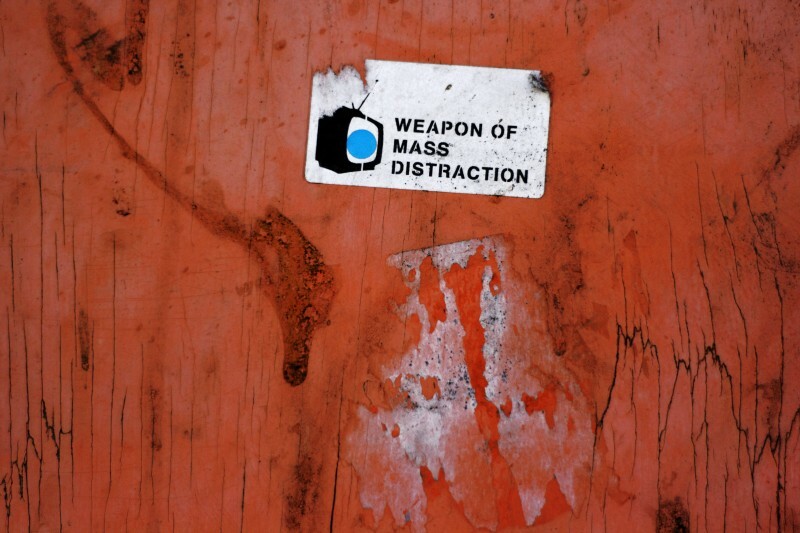 The task of such a research program would be to focus not so much on the content of the distraction but on the affective experience of being distracted, which announces that the world you inhabit is not a matter-of-fact one—that this moment of distraction that you are experiencing is worthy of your attention. Perhaps rhetorical theory’s focus on attention has led to theorizing the experience of those for whom the world was built. This theoretical effort should be reoriented toward, in Ahmed’s words, “that which slips.” It should be more open to the embodied experiences of distraction and to the bodies that never quite easily slotted into place. Demands on our attention are announcing something. But what? Who or what is addressing us, and who are “we”? From where does this address come? We don’t know, but an answer that involves sealing ourselves off from the address is one that is only available to a select slice of the population. Thus, it is not a solution at all. Perhaps “we” have not been distracted enough. Ahmed, Sara. “Feminist Killjoys (And Other Willful Subjects).” Scholar & Feminist Online 8, no. 3 (2010). http://sfonline.barnard.edu/polyphonic/print_ahmed.htm. ———. “Orientations: Toward a Queer Phenomenology.” GLQ: A Journal of Lesbian and Gay Studies 12, no. 4 (2006): 543–74. Ahmed, Sara. “Selfcare as Warfare.” Feministkilljoys. Accessed August 28, 2015. http://feministkilljoys.com/2014/08/25/selfcare-as-warfare/. Carr, Nicholas. The Shallows: What the Internet Is Doing to Our Brains. New York: W. W. Norton & Company, 2011. Crawford, Matthew B. The World Beyond Your Head: On Becoming an Individual in an Age of Distraction. New York: Farrar, Straus and Giroux, 2015. Davis, Diane. Inessential Solidarity: Rhetoric and Foreigner Relations. 1st ed. University of Pittsburgh Press, 2010. “Distraction, N.” OED Online. Oxford University Press. Accessed August 28, 2015. http://www.oed.com.proxy.libraries.rutgers.edu/view/Entry/55730. Kweku, Ezekiel. “Slow Poison.” Pacific Standard. Accessed August 28, 2015. http://www.psmag.com/health-and-behavior/even-if-the-police-dont-kill-me-a-lifetime-of-preparing-for-them-to-just-might. Lanham, Richard A. The Economics of Attention: Style and Substance in the Age of Information. Chicago: University of Chicago Press, 2006. Lanham, Richard A. The Electronic Word: Democracy, Technology, and the Arts. University Of Chicago Press, 1995. Turkle, Sherry. Alone Together: Why We Expect More from Technology and Less from Each Other. First Trade Paper Edition edition. Basic Books, 2012.